I’ve had the Kobo Touch Edition for about a week now, and as you might remember from my first impressions post, I was pretty sure that I would like the device. 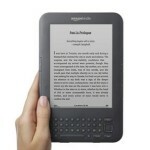 A week on, I’m happy to say that I do like the device a lot, but it isn’t a perfect eReader. But maybe perfection isn’t what we should be shooting for either. If you remember from my first impressions post, the Kobo Touch Edition is going up against my iPad as an eReader. This is a really important distinction here. If I were comparing the Kobo to a Kindle, Nook, or Sony eReader I might have come to some different conclusions. I also freely admit that I really like the Kobo software on iOS. I like what Kobo is doing to make reading social and adding new features hand over fist with each update. Finally, I had been looking at getting an stand alone eReader because I do see how the iPad is a somewhat flawed device as an eReader. With that all out of the way, let’s get into the review. As I expected, the Kobo Touch Edition is great for reading books. The text is nice and easy to read without straining my eyes, this is despite the much smaller screen than the iPad. I had read about the Touch Edition not responding to touches very well and I didn’t have too many problems with this. I think the issue is that we are used to iOS and similar touch interfaces which are very touch sensitive, whereas the Kobo needs a little firmer tap, swipe, double-tap, or tap and hold to make it respond.